I hate Lee because his story is always about trying to take over the Zaibatsu. Can't Kazuya, Heihachi or The Tekken Force kill him and get it over with? I also question his sexuality at times. Ganryu. A sumo that always falls in love and gets rejected. Lame. The only good thing about him is that look on his face when he gets rejected. The new Armour King. The best thing is that he's not hard to beat. Law - >_> When I first started playing I always got the crap beat out of me by him ><. Heihachi - >_> Old man in a Diper >< Enough said. Murdak - >_> I just always hated him. 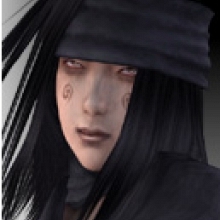 Raven - >< Worthless peice of crap who gives a bad name to ninjas like Naruto does. I still stand by my words that Bryan and Yoshi are the only TK characters I actually like. Also, Bruce has become a character I would very much wish to see getting his @$$ kicked. He's very dull and meaningless character in the whole game. Does he even have a personality? i must admit it is very bad fact that christie can be spamed. all the time when i play in college this one class mate who seems to love christie spams all the low moves and then i have to go spaming my raven and the the boy in my class keeps saying i keep doing the same move when he knows he is just playing cheap. Why Do so Many of U hate Jin????? Kogamitsu : Also, Bruce has become a character I would very much wish to see getting his @$$ kicked. He's very dull and meaningless character in the whole game. Does he even have a personality? You give him a bit of a personality in your fanfiction, though. He always just strikes me as "one of those guys you'd see on Ultimate Fighter." Anyway, as to characters I can't stand...Roger and Alex pretty much top the list. vijay_kumar_cute : Why Do so Many of U hate Jin????? I hate Jin because he?s been over exposed. He gets all the storyline focus, yet I don?t find him interesting at all. In fact, the only Mishima I actually like is Heihachi. The Tekken storyline needs to take a different turn for once and take Jin out of the spotlight a bit. Devil Jin > Devil Kazuya though. i know what you mean next tekken game is not out and he is the prime player already, i mean tekken 3 and 4 ok, but now they have gone over the top. oh and not that im sticking up for koga but, it was just a story and maybe her adding bruce to the story was a must not because she wanted to. Bruce, Steve, Nina, Anna, Raven, Wang, Jack. Raven is cool he is just a cooler version of yoshi. fastlegs : Raven is cool he is just a cooler version of yoshi. Nobody's cooler than Yoshimitsu!!!! Especially not that hack Raven, aka Blade without the fangs. easy there tora I ment for his generation. yoshimitsu is also cool but for his generation he would be conserded cooler then raven. I like both Yoshi and Raven, you guys just need to lay off a bit. Tora's sword melts from fastlegs getting out a lighter and putting it undernith tora's sword.